Having damaged, decayed, or missing teeth can have a huge impact on your health, well-being, and quality of life. With restorations, you can recover your smile and enjoy life to the fullest. At Houstonian Dental, we love helping patients experience better dental health and confidence through restorations. Our skilled dental team combines knowledge with artistic skill to design and place restorations that are functional and lifelike. Wondering what your life would be like with a healthier smile? Contact our office and schedule a consultation today! Do I Need a Dental Restoration? Restorations encompass services that help to restore an unhealthy smile. Teeth that are decayed, damaged, broken, or gone can all be repaired or replaced with dental restorations. What Kind of Restoration Do I Need? Once your dental issue has been identified, the dentist will help you understand your restoration options. Many dental problems have more than one treatment option, and it’s important to consider which will work best for your particular case. Are Restorations Bad for Your Teeth? Just the opposite! 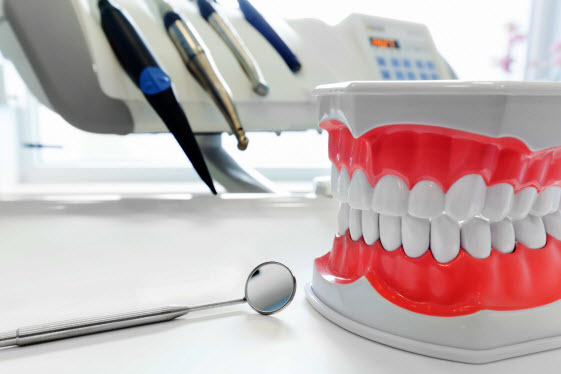 Restorations, such as fillings, crowns, and implants, are designed to treat existing problems. They heal and protect your teeth rather than harm them. That said, the healthiest option for your teeth is preventing dental issues and preserving your natural smile. Regular cleanings and exams can help your teeth stay healthy and whole, reducing the chances that a restoration will be needed. If you have missing teeth, you’ve likely heard about dental implants and may be wondering if they’re right for you. As the only tooth replacement that replaces the root as well as the tooth crown, dental implants offer many health benefits on top of aesthetics. Both dentures and implants replace missing teeth with a functional recreation, allowing you to speak, eat, and smile normally. However, dental implants offer long-term benefits that dentures don’t. Stability – With the implants anchored into the jaw, you have no risk of the prosthetic slipping or falling out. Convenience – Implant restorations are permanently fixed in place, so you don’t have to worry about taking them out for special cleanings. Health – By replacing the tooth root, implants protect your jaw bone strength and preserve your youthful features. They also keep your teeth from moving out of alignment. Any adult can get dental implants as long as their gums and jaw are healthy enough. Implants aren’t recommended for children because their jaws are still growing, which would affect how the implants are placed. When evaluating you for implants, the dentist considers two main aspects of your health: your jaw bone volume and the health of your gums. If your jaw bone is too thin or weak, the implants won’t have the support they need. Unhealthy gums can also affect healing, bone growth, and the longevity of the implant, so any gum disease needs to be addressed before implants are placed. The dental implant procedure typically takes 3-4 dental visits depending on your situation. A consultation and planning visit allows the dentist to see whether you’re eligible for implants, how many would be needed, and whether you would need any teeth extracted. Any extractions require time to heal, allowing the bones and gums to recover. In some instances, patients can have an extraction and implant placement at the same time, but this depends on the condition of their jaw bone and is not for everyone. Implant placement is also followed by a 3-6 month healing period while the titanium implant post fuses with the jaw bone. You’ll have a temporary prosthetic during this time to allow you to speak and eat normally. Once your healing is complete, you can return to the dental office to have your custom restoration placed. This procedure is one of the most advanced dental techniques you can get today. 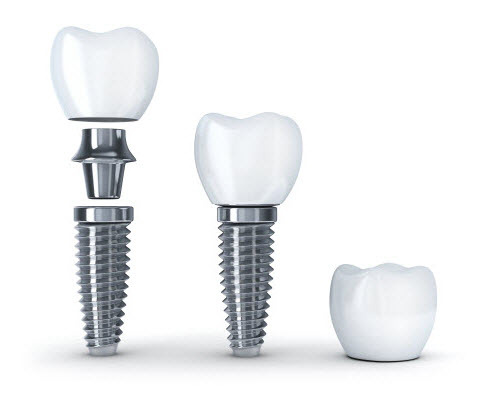 A whole row of teeth can be placed on the foundation of four surgically placed implants. The first step to receiving All-On-Four dentures is determining your candidacy for the procedure. At your initial consultation, we will review your medical history, examine your dentition, and discuss your treatment goals. At Houstonian Dental, we work with you to determine what restoration option is best for you. Even if you already wear dentures, we may be able to convert your current restorations into an All-On-Four treatment. Considering Implants? Here are 5 Questions to Ask the Dentist! How many implants would I need? How much would implants cost for me? Cavities are something we all want to avoid, but fortunately, getting a cavity today doesn’t have to mean the end of your smile. Composite (white) fillings allow your tooth to be restored in health and function while also preserving your aesthetic smile. Plus, thanks to innovations in techniques and material, composite fillings placed today last longer than ever. 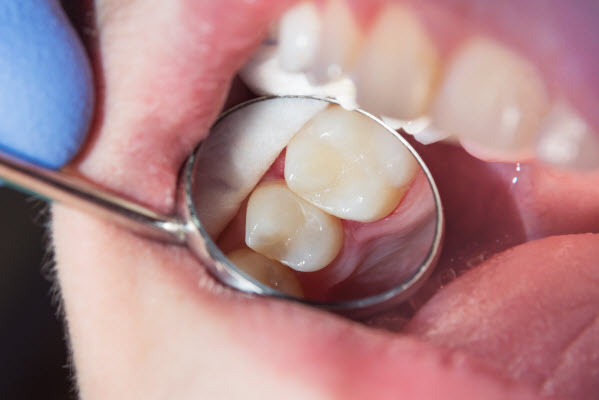 How Do Teeth Get Cavities? Cavities happen when bacteria in your mouth leave acidic plaque on your teeth, which slowly eats away at tooth enamel and causes it to decay. They’re more likely to occur in areas that are hard for a toothbrush to reach, such as between the teeth, at the gum line, or in crevices on the chewing surface of molars. You can sometimes see cavities as a dark area in your tooth. Can I Replace My Metal Fillings with Composite Fillings? Many people choose to replace their old metal fillings with amalgam. If a filling is old, failing, or new decay has occurred, it’s an ideal time to switch to a composite filling. The process is simple and can usually be done in a single visit. The dentist removes the old filling and any new tooth decay. The composite material, which is color-matched to the tooth enamel, is then filled in, shaped, and hardened into place. When it’s done, many patients can’t even tell the difference between the filling and their natural enamel. Will I Have to Get a Root Canal? Most cavities don’t need root canal therapy. This treatment is only used when the cavity has reached the inner tooth, leading to an infection. Root canal therapy allows the dentist to clear the infection and fill in the tooth, saving it from an extraction. Once the therapy is complete, the tooth is capped with a crown to prevent further infection or damage. Are Dental Crowns Good or Bad? Having a dental crown is like having a permanent cast on your tooth. You hope you’ll never need one, but if you do, it’s a good thing to have. Crowns are used when teeth have a significant problem that can’t be solved by more conservative treatment. Although they require your enamel to be reshaped to place them, they also protect your teeth and help you to avoid invasive treatments like extractions. Protect tooth that’s cracked or broken. Preserve tooth with severe decay. Cap a tooth after a root canal. Reshape a tooth that’s damaged or worn. Should I Get a Bridge, Partial Dentures, or Dental Implants? If you have a gap of missing teeth, the dentist may present you with three options – a bridge, partial dentures, or dental implants. Each type has advantages and drawbacks, so it’s important to consider each option carefully. Dentures have been around for centuries, and are the most well-known tooth replacement options. Thanks to innovations in dental technology, dentures are now lighter, more realistic, and more comfortable than they’ve ever been. If you are missing most or all of your teeth, dentures can restore your ability to speak, eat, and chew with confidence. Should I Get Full or Partial Dentures? If you are missing most of your teeth, you may consider getting partial dentures or replacing the remaining teeth with full dentures. There can be advantages to both options, so it’s important to ask the dentist the right questions to help you decide. Would my remaining teeth support partial dentures? Are my remaining teeth healthy? Would full or partial dentures be more comfortable? How would either type of dentures affect my health? Is It Hard to Get Used to Dentures? It’s perfectly normal if it takes time for you to get used to wearing dentures. While they do feel different from your natural teeth, over time, your mouth will grow accustomed to speaking and eating around your dentures. If your dentures feel uncomfortable even after several weeks, or they become less comfortable over time, make an appointment with the dentist. Your dentures may need adjusting, maintenance such as relining, or even replacement. A Healthy Smile is Achievable! At Houstonian Dental, we understand what a struggle an unhealthy smile can be. Our dentists provide realistic solutions tailored to you and your smile. Schedule your visit to our office and take the next step toward better dental health today!